Hertfordshire County Council customer service contact number is 0300 123 4040, available Monday – Friday 8:00 am – 8:00 pm, Saturday 9:00 am – 4:00 pm. However, live BSL SignVideo interpreting service is available Monday – Friday 8:00 am – 6:00 pm. Similarly, visit Hertfordshire County Council contact us page to use online message form. Click on Email General Enquiries link to proceed. Hertfordshire County Council is upper-tier local authority for non-metropolitan county of Hertfordshire in England. It offers regulatory services for children’s social care, libraries and archives, schools and education, roads and pavements, highways, recycling, adult social services, births, waste and environment, fire and rescue, deaths and marriages, business, and health sectors. Visit Hertfordshire County Council website to learn more. Hi Nathan, sorry to hear that you've not got a response so far, you can call our adult care line at our customer service centre on 0300 123 4042 which may speed up the process. Hertfordshire County Council contact number for adult social services assistance is 0300 123 4042. Remember, Hertfordshire County Council opening times for adult social services are Monday – Friday 8:00 am – 8:00 pm, Saturday 9:00 am – 4:00 pm. Visit Hertfordshire County Council adult social services page to learn more about how to report a concern about an adult and adult social care assistance, Blue Badge application or renewal. Hertfordshire County Council contact number for requesting emergency equipment repairs is 0754 360 2651, available Monday – Friday, 5:00 pm – 10:00 pm, weekends and bank holidays 8:00 am – 10:00 pm. Contact Hertfordshire Equipment Service on the above number in case you need to request an emergency repair of equipment loaned to you. These repair services are available for profiling beds, mobile hoists, or air mattresses. Hertfordshire County Council contact number for Dial-a-Ride 0199 255 6771, available Monday – Friday 9:00 am – 4:30 pm. Dial-a-Ride is door-to-door travel facility for seniors over 75 and others with permanent disability. Visit Hertfordshire County Council transport for people who can’t drive or use public transport page to learn more and apply online. Hertfordshire County Council Dial-a-Ride number for seniors and others with permanent disability from Broxbourne is 0199 253 4269, available Monday – Friday 9:00 am – 4:30 pm. Remember, you need proof of age and / or disability to avail Dial-a-Ride facility. Further, above Dial-a-Ride page has information about Action on Disability and other community transport options available in Hertfordshire County Council postcode areas. Hertfordshire County Council contact number to apply for free school meals is 0300 123 4048. This Hertfordshire County Council free school meals number is available Monday – Friday 8:00 am – 8:00 pm, Saturday 9:00 am – 4:00 pm. Visit Hertfordshire County Council free school meals page to learn more. This page has information about free school meals, uniforms, and cheaper music lessons, bus, or train travel for children. Visit Hertfordshire County Council library and archives page to learn more. Hertfordshire County Council library login is available to registered users. Enter borrower ID and PIN to continue. Further, the above page has links to Hertfordshire County Council email address forms to report a highway fault and all other highways queries message form to contact Hertfordshire County Council head office online to report a fault or concern. Hertfordshire County Council contact number to book a driver training course is 0300 123 4035, available Monday – Friday 8:00 am – 8:00 pm, Saturday 9:00 am – 4:00 pm. Contact on Hertfordshire County Council contact number to learn about speed awareness and driver training. Hertfordshire County Council contact number for births, death, marriages, or citizenship registration team is 0300 123 4045, available Monday – Friday 8:00 am – 8:00 pm, Saturday 9:00 am – 4:00 pm. Alternately, contact registrations team online via email at [email protected]. Hertfordshire County Council contact number for citizenship team is 0170 789 7396, available Monday – Friday 8:00 am – 8:00 pm, Saturday 9:00 am – 4:00 pm. Send your requests to citizenship team online via email at [email protected]. Hertfordshire County Council contact number to find waste and recycling centre is 0300 123 4051, available Monday – Friday 8:00 am – 8:00 pm, Saturday 9:00 am – 4:00 pm. Contact waste and recycling team via email at [email protected]. Further, visit Hertfordshire County Council recycling, waste and environment page to learn about access and rights of way, wildlife (ecology), landscape, archaeology (historic environment), green issues, water and flooding, recycling and waste, planning, and Countryside Management Service. Visit Hertfordshire County Council household waste recycling centres page to locate the nearest recycling centre. Use above Hertfordshire County Council contact number in case you need help finding a centre or obtain a van permit. Remember, trading standards protect consumers, work with businesses, and act against rogue traders. Visit Hertfordshire County Council trading standards page or contact Hertfordshire County Council customer service centre to learn more. Hertfordshire County Council media centre contact number is 0199 255 5537. This Hertfordshire County Council press office number is available Monday – Friday 8:30 am – 5:30 pm. However, Hertfordshire County Council provides an alternate number for after office hour contact. Hertfordshire County Council media centre contact number for emergency media and press enquiries out of office hours is 0785 000 7382. Remember, you can view Hertfordshire County Council Twitter feed for live updates from the press team. Alternately, above media centre page has links to published Hertfordshire County Council news and other important updates. Hertfordshire County Council stop smoking service freephone number is 0800 389 3998. Send your stop smoking requests via email to [email protected]. Further, Hertfordshire County Council contact telephone number to send a text message is 80818. Remember to send Text SMOKEFREE to 80818. Hertfordshire County Council regulates over 300 local stop smoking services. Visit Hertfordshire County Council stop smoking services page to use online clinic search tool. More information is available on Hertfordshire County Council thinking about giving up smoking page. Contact Hertfordshire County Council UK on the above number or email address for further assistance and consultations. Call TV Licensing customer service 0300 790 6130 or 0300 790 6112 if you would like to get in touch with a member of their customer service team. This is the dedicated number to contact for any general questions or concerns that you may have with regard to the products or services that they offer. Alternatively, you can send your queries to them online by filling in the email contact form on their website. For customers who are deaf or hard of hearing, a minicom facility can be accessed by calling the TV Licensing phone number 0300 790 6050. If you would like to use the Welsh language, the phone number to dial is 0300 790 6053. To get your TV Licence or reminder in a range of accessible formats such as by email or in Braille, large print or audio, you can make a request by calling customer service team on 0300 790 6076. Dial TV Licensing customer service number 0300 790 6165 if you have any questions or concerns regarding short term TV Licence or over 75 TV Licence. UK residents that are aged 74 and will turn 75 prior to the expiration date of their next TV Licence are eligible to purchase a short term TV Licence. This will get you covered until your 75th birthday when you will be entitled to a free over 75 TV Licence. With a short term TV Licence, you will only need to pay for the number of months between the expiration date of your current licence and your birthday. If you would like to apply by phone, call the TV Licensing phone number with your National Insurance number to hand. You will be able to find it on your bank statement if your pension is paid into your bank account. If you do not have a National Insurance number, you can still call TV Licensing UK and they will arrange for you to provide them with other proof of your date of birth. For your payment card related queries, call TV Licensing Payment Card number 0300 555 0286. If you pay for your licence using a TV Licensing payment card or savings card and would like to avail of the short term TV Licence, dial this number to apply over the phone. They will then automatically issue you with a free over 75 TV Licence when it becomes due. Call TV Licensing Direct Debit number 0300 790 0368 if you are a customer with any queries with regard to your Direct Debit account. This is also the dedicated phone number to dial if you pay all in one go. Journalists with media enquiries can contact the by calling TV Licensing Press Office Enquiries number 0208 752 6606. The press office team is available to answer your queries at any time of the day. Alternatively, you can make an enquiry by sending them an email at [email protected]. You can also get more information by following TV Licensing on Twitter @TVLicensingNews, by subscribing to their YouTube channel, or by viewing their photos on Flickr. If you would like to find all the latest TV Licensing news and press releases, go to their Media Centre. To get more information about TV Licensing community relations work, charity organisations and community groups, call the TV Licensing Community Relations number 0208 752 6537. Alternatively, you can submit your questions or concerns to them via email at [email protected]. Customers seeking the TV Licensing customer service numbers can find it on their website at http://www.tvlicensing.co.uk/. At the bottom of the web page, click on the Contact Us link located on the lower left side. You will be taken to the page where you will need to enter your question on the box provided. The page will provide you with answers that may help you. If you are unable to find the answer you are looking for, click on the contact us button and the TV Licensing contact form will appear for you to fill in. To get their contact numbers, click on ‘Other ways to contact us’ below the form. To sign in to your TV Licensing account online, go to the login page on their website. To be able to log in, you will need to enter your TV Licence or customer number, your last name as it appears on the TV Licence, and the postcode of the licensed address. If you do not know your TV Licence number, you can alternatively skip this and you will be asked for other information for you to be identified. When you are registered for a TV Licensing account, you can view, renew or change the details on your TV Licence online. Call the Flintshire County Council customer service number 0135 275 2121 for your general enquiries. If you know the extension number of the department that you would like to get in contact with, call the number directly prefixing it with 70. For example, (01352) 70 1111. Alternatively, you can submit your enquiries to them online by filling in their general enquiry contact form. If you would like to get the Flintshire County Council contact phone numbers of their various departments, go to their contact us page. Aside from giving them a call and completing their online enquiry form, you can also make an enquiry through social media by joining Flintshire County Council’s Twitter and Facebook groups. You can find the links of their groups on their website. Any person who has concerns or suspicions regarding a child in Flintshire being harmed can call the Flintshire County Council customer service telephone number 0135 270 1000. They will discuss your concerns with you and ask for as much information as possible. They will carry out an investigation on your concern, and if needed, make a plan to protect the child that might include adding the name of the child to the Child Protection Register. You do not have to worry because they will respect your right to confidentiality. To enquire about bins (domestic waste), buses, dog fouling/dog bins, fly tipping and gritting, call: 0135 270 1234. This is also the phone number to dial if you have enquiries relating to pest control, recycling and roads. For any questions or concerns that you have about school transport, streetscene and street lighting, such as traffic lights, make an enquiry by calling this phone number. You can also enquire by email at [email protected]. This Flintshire County Council contact phone number can also be called upon if you need to report a problem with regard to car parking. Alternatively, send your report to them through email at [email protected]. Use this number: 0135 270 3030 for any enquiries that you have related to licensing. They are responsible for licensing and monitoring a number of types of business activities conducted within the area. These activities include placing a builder’s skip on the highways and operating a zoo. They carry out checks and inspections regularly and inspect premises in order to make sure that all the terms and conditions attached to the license or registration are being followed. They perform investigations on complaints including those concerning premises that reportedly operate illegally without a license. The Register Office is an ideal venue for any kind of ceremony. The hall was created by Thomas Jones, a local architect and county surveyor and was completed in the year 1830. Dial 0800 854 440 free number to get in touch with the National Fraud Line if you suspect any type of housing benefit fraud. If you have hearing or speech difficulties and are using a textphone service, the phone number to dial is 0800 328 0512 free number. For Welsh speakers, the Flintshire County Council customer service telephone number to call is 0800 678 3722 free number . How to Find the Flintshire County Council Numbers? The Flintshire County Council customer service telephone number that you can call depends on the department that you would like to get in touch with. To find the list of their contact numbers, go to their website at http://www.flintshire.gov.uk/. Scroll down to the bottom of the web page, then click on the Contact Us link located at the left corner. It will take you to another web page where you need to choose a topic or concern. Once you have selected, you will be directed to the Flintshire County Council contact number helpline that you are looking for. Call the number 0161 770 3000 if you have general questions or concerns with regard to the services that they provide and their work to become a co-operative borough. This is also the phone number to dial to access their switchboard. Alternatively, send your enquiries to Oldham Council via email at [email protected]. They will aim to acknowledge that they have received your email within 24 hours, provide you with a full response about your enquiry within 5 working days, and give you the contact information of the person responding to your email. From this location, you can access a wide range of services, such as Housing and Council Tax Reduction, Oldham Council Tax, and free school meals. There are several different facilities within Access Oldham, including free phone and Internet to access Council services, interview rooms with wheelchair access, and loop system. The Access Oldham is open from 8.40am to 5pm on Mondays, Tuesdays, Thursdays and Fridays, and from 9.30am to 5pm on Wednesdays. Alternatively, if you are making an enquiry by post, Oldham Council customer service team will acknowledge their receipt of your letter within 5 working days, provide a complete response to your query within 10 working days, and give you the contact information of the person responding to your enquiry. If you would like to know more about Oldham Council jobs, visit their careers page. Oldham Council provides a range of services to help people affected by adoption. They offer support for adopted children, adoptive parents and families, birth parents and relatives, and adopted adults. They also provide adoption support funds. The adoption support services of Oldham Council include information and advice, support groups, help with accessing birth records, counselling, supporting post adoption contact, and duty officer available to respond to queries 5 days a week. Call the Oldham Council customer service team for further questions. In case you are reaching out to Oldham Council customer service team out of their office hours, the phone number to call is 0161 770 6936 and an experienced social worker from the Emergency Duty Team will be available to respond to you at anytime. To use the Minicom service, dial 0161 770 8302. If you are enquiring by fax, send to 0161 770 8502. By email, send to [email protected]. The Oldham Council’s Animal Warden Service deals with stray animals. For more information, visit their Stray Animals page. Call the Oldham Council number 0161 770 6633 to speak to a representative about Benefits Service. Through this service, you can ask for advice about Council Tax, benefits, your application and payments. Apart from giving them a call, you can also make an enquiry by email at [email protected] or by fax on 0161 770 4945. If you are having any problem with your benefit, the Oldham Council customer service telephone number to dial is 0161 770 6655. Alternatively, report an issue by filing in their email contact form. Keep in mind that the Oldham Council cannot give any comments on cases under investigation. Therefore, if you report someone, they will not be able to give you an update on how the investigation is proceeding. Call the Oldham Council number 0161 393 7117 if you would like to get housing advice. The Oldham Council Housing and Advice Service provides you with comprehensive advice on a wide range of housing options and the services available in Oldham, regardless of your personal circumstances. They can give you advice and support on homelessness, social rented housing, housing options to people living with disabilities, help to move into or manage your home, affordable housing schemes, problems with paying your house rent or mortgage, downsizing your home, and more. In order to report required repairs to FCHO properties, call the Oldham Council customer service telephone number 0161 624 8286. This is also the phone number to dial for any other housing issues that you have. You can also make a complaint online by filling in their feedback and complaint form. There is a lot of Oldham Council customer service telephone numbers and the one you should use depends on your concern and the department that you need to get in touch with. In order to find these phone numbers, go to their website at http://www.oldham.gov.uk/. Scroll down to the bottom of the web page, and then click on the Contact Us link. It will take you to a different web page where you have to choose the proper category to get the Oldham Council contact number helpline that you are looking for. Call the Ofgem customer service 0207 901 7295 to get in touch with their Consumer service. This is the phone number to dial if you are a consumer that has questions or concerns with regard to their policies and functions. Note that it does not deal with individual consumer complaints against energy companies. Aside from calling the Ofgem contact number helpline, you can also make an enquiry by fax on 0207 901 7066 or by sending them an email at [email protected]. While the Consumer Affairs Team tries to answer each call right away, you may be asked to leave a voice message if they are busy taking other calls. If you leave a message, they will give you a call back as soon as possible. Ofgem stands for the Office of Gas and Electricity Markets. They are a non-ministerial department of the government and an independent National Regulatory Authority. Their main objective when carrying out their function is to protect the interests of the existing and future electricity and gas consumers. They do this in a variety of ways such as promoting value for money, promoting sustainability and security of supply for the present and future generation of consumers, residential and industrial users, supervising and developing markets and competition, as well as regulating and developing government schemes. Ofgem aims to be fair and transparent in their work all the time. Their practices include providing complete, efficient and thorough consultation opportunities to those who are interested in the way they explain their approaches and reach their decisions, including their plans and strategies. They arrange meetings and workshops as they share with stakeholders the analysis underpinning thei decisions that they make. At Ofgem, they also hold briefings as well as occasional seminars for those who are interested, including Parliament and the Press. In addition, they also make sure to publish the minutes of Authority meetings. Feel free to call the Ofgem customer service telephone number during their hours of operation if you would like to get to know more about what they do. If you are looking to work for them and would like to find out about the current Ofgem jobs available, you may refer to their Ofgem careers web page. In order to speak to someone from the Ofgem Domestic RHI Applicant Support Centre, dial the Ofgem contact phone number 0300 003 0744. Once you have started the application process and afterwards, this is the contact number that you can call should you have any enquiries. Alternatively, your queries can be submitted to Ofgem RHI team through email at [email protected]. You may also refer to their Domestic RHI contacts, guidance and resources section for further support. Call the Ofgem contact number helpline 0845 200 2122 *Up to 9p/minute and access charge* to get in touch with the Non-Domestic RHI team. They are the ones who can assist you if you would like to apply for the scheme, if you need support with the application process, or if you would like to enquire regarding the progress of your application, the eligibility requirements or their published guidance. You also have the option to submit your enquiries to them through email at [email protected]. To make an enquiry about renewable electricity schemes, dial the Ofgem customer service telephone number 0207 901 7310. Call this phone number and press option 2 to enquire regarding Ofgem Renewables Obligation (RO) or Fuelling and Sustainability. Alternatively, enquire via email at [email protected] for RO, and at [email protected] for Fuelling and Sustainability. To get more information on Ofgem Feed In Tariff scheme, call this contact number and press option 1, or send an email to Ofgem fit team at [email protected], [email protected], or [email protected]. For any enquiries related to Climate Change Levy (CCL) or Renewable Energy Guarantees of Origin (REGO), call the Ofgem customer service telephone number and press option 3. You can also enquire by sending them an email at [email protected]. Call the Ofgem customer service telephone number 0300 060 4000 or send an email to [email protected] if you have questions about Energy Company Obligation (ECO). This is also the phone number to dial for queries related to Warm Home Discount (WHD. Alternatively, enquire by email at [email protected]. For any questions on the scheme as a whole, the email address to send your enquiries is at [email protected]. Call the Ofgem contact phone number 0207 901 7179 if you are a member of the media and have an enquiry about the CMA market investigation, their wholesale markets work, including on security of supply as well as their regulation of networks. This is the contact phone number to call to speak to their Senior Communications Manager Tim Webb, who deals with these types of queries. You can also send him an email at [email protected]. Ofgem has a wide range of responsibilities, which is why each of their members specializes in different aspects of their work. Should you have an urgent media enquiry outside their opening hours, get in touch with the duty officer on 0776 651 1470. 0207 901 7460. Alternatively, you can send an email to their Communications Manager Ruth Somerville at [email protected]. For any questions or concerns that you have related to wholesale markets and transmission networks, call the Ofgem contact phone number 0207 901 7225 to speak to their Communications Manager Chris Lock. You can send him an email as well at [email protected]. For these types of enquiries, you can also call the Communications Officer Joe Moss on 0207 901 7178, or get in contact with him via email at [email protected]. For any enquiries that you have relating to Ofgem E-Serve’s administration of the government’s environmental programmes, call the Ofgem contact phone number 0207 901 3111. You can speak to their E-Serve Media Manager, Stuart Forsyth through this phone number. You can also send him an email at [email protected]. In order to find the Ofgem customer service telephone numbers and other ways to get in touch with them, go to their websiteat https://www.ofgem.gov.uk/. Click on the Contact Us link, which you can see on the right side as you scroll down to the bottom of the web page. It will direct you to another web page where you need to choose the appropriate category to get the Ofgem contact number helpline that you are looking for. You will also be able to find their different addresses on that page. It is easy to complain about your energy supplier. Visit this Citizens Advice page and complain. Here is Ofgem page with all the information regarding the complain proces. To reach one of the customer service representatives from Transport for London, the phone number to call 0343 222 1234 – a 03 number local rate. The lines are open 7 days a week, including public holidays. Tfl has other dedicated contact numbers that you can use for your specific enquiries. Hi, For lost property please call Customer service on 0343 222 1234 btn 08:30-16:00 and register all your details. Call the Transport for London customer service 0343 222 1234 if you would like to get in touch with a member of their customer service team. This is the phone number that you can call for any questions or concerns that you may have with regard to the Transport for London oyster card, fares and payments, refunds, travel services, and roads. If you are not satisfied with the product or service that you have been provided with and would like to make a complaint, you can do it through this phone number as well. For customers who have hearing disabilities and are using a textphone, the phone number to call is 0800 112 3456 free number. If you are calling about Fleet Auto Pay, dial the Transport for London contact number helpline 0207 649 9860. 0343 222 7777. You can call this phone number whether you have any questions or concerns with regard to Dial-a-Ride, or would like to make your booking over the phone. You can also manage your existing booking through this phone number, such as cancelling or amending a booking. Make sure to make your booking at least one day in advance. If you would prefer to make a booking online, visit the Transport for London booking page. Call the Transport for London 0208 681 8300 in order to enquire about lost property on Trams services.. For boats, get in touch with the boat operator. For piers, send them your enquiries through email at [email protected]. The company also has their email contact form that you can use to ask about lost property on London Buses, London Underground, Docklands Light Railway, London Overground, Victoria Coach Station, Black Cabs, Emirates Air Line and TfL Rail. Note that it may take up to 10 days for the items that they find to be delivered from stations and garages and entered on their system. Dial the Transport for London contact number: 0845 604 4141 *Up to 9p/minute and access charge*to get in touch with their team. This is the contact number to call for your media enquiries. Alternatively, you can make an enquiry by sending them an email at [email protected]. Note that these contact details are for journalist enquiries only and the Transport for London Press Office is unable to help with general queries or complaints. Transport for London offers a wide range of opportunities and a great place to develop your skills. If you are looking to work and become a part of their growing team, you can visit the Transport for London jobs page in order to find out more about their current career vacancies. Alternatively, you can follow them on Twitter for career information and on LinkedIn for jobs, apprenticeships and graduate opportunities. Customers who have general enquiries can find the Transport for London customer service telephone numbers by visiting their official website at https://tfl.gov.uk/. Scroll down to the bottom of the web page, then click on the About TfL link under the Help & contacts column on the left corner. Once you are in the About TfL page, scroll down until you are able to see the Transport for London contact number helpline that you are looking for. The web page will also provide you with the other ways that you can do to get in touch with the company’s customer service team. The Student Finance customer service telephone numbers for loan enquiries can be found by going to their website at https://www.gov.uk/student-finance/overview. 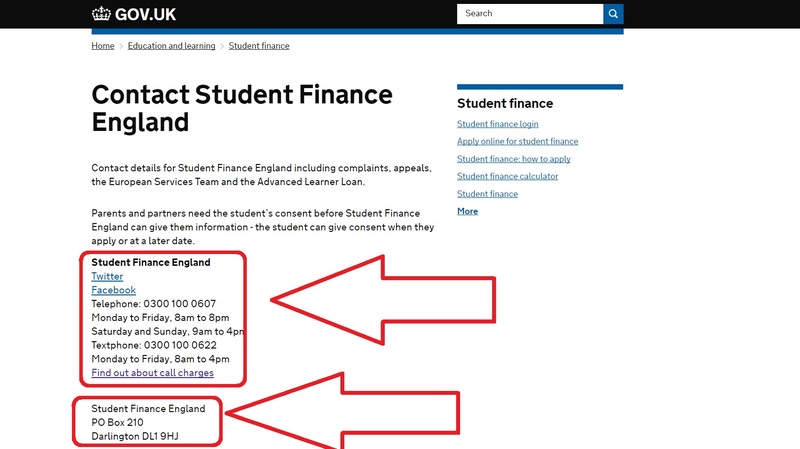 At the right side of the web page, click on the Contact Student Finance England link. It will then take you to the web page where you can get the Student Finance contact number helpline that you are looking for. Aside from contact phone numbers, the web page will also provide you with the other Student Finance contact information, such as their addresses and email. Call the Student Finance customer service telephone number 0300 100 0607 if you would like to get in touch with a member of their customer service. This is the contact phone number that you can call for any questions or concerns that you may have with regard to the services that they offer. If you are contacting the Student Finance using a textphone, the Student Finance contact number helpline to call is 0300 100 0622. Student Finance is responsible for students that are looking to borrow funds to pay for their university or college tuition fees in the United Kingdom. You may be eligible to get additional funds on top of it depending on your circumstances, for instance, if you are a person with a disability, if you are on a low income, or if you do have children. You will start repaying for your Student Finance loan once you earn more than a particular amount. The amount of your monthly repayments will be based on how much you earn, and not on what you owe. Interest will start accruing from the day that you take out the loan. If you have any questions about Student Finance loan and repayments, the Student Finance customer service telephone number is available 7 days a week. If you are looking to get a Student Finance loan, there are different ways that you can do to apply for Student Finance depending on your situation. If you are a new student from England, whether you are a full-time or part-time student, you can apply for the loan by simply setting up an online account with the company and by completing the Student Finance application form. You are a continuing student if you already got finance last year. Continuing students can log into their student finance account if they would like to apply online. New EU students can apply by downloading the necessary application pack, while continuing EU students will be sent the application forms. There is a different process if you started before September 1, 2012, as well as if you are a student from Wales, Scotland, and Northern Ireland. Call the Student Finance contact number helpline during their opening hours if you have any questions related to these processes. Parents and partners who would like to enquire about a specific loan will need to have the student’s authorization in order to get information from Student Finance England. The student can provide permission either during their application or at a later date. When you sign in or register for Student Finance online, you will be able to view your statements and letters from Student Finance England, and track any existing application that you may have. By logging in to your account, you will also be able to check when your payment is due, update some of your personal or application details, and reset your password or find your customer reference number. You can also apply for finance as a new or continuing student through your Student Finance login. You can sign up for a new Student Finance online account through their website. You will be provided with a customer reference number (CRN) and you will be asked to create a password and secret answer to security questions when you set up your account, which you will need every time you log in. These information are sent by post if you do not apply online. If you would like to find out more about the extra help that you may be able to get, check on the student finance calculator. This calculator is for students from England or the European Union (EU) starting a new course. You can use the student finance calculator to estimate student loans, and extra student funding, if you are a person with disability or you have children to support. Note that your result will be more accurate if you know your annual household income (the income of your parents or partner plus your own). If you have a disability, long-term health condition, mental health condition or a specific learning difficulty like dyslexia, then you can apply for Disabled Student Allowances, or get extra help if you are experiencing financial hardship. You may also qualify for disability related benefits. Medical, social work and teacher training students can apply for help with costs of travel to the UK clinical placements. You can apply for this if you are studying a medical, healthcare or dentistry course, if you are a social work student, and if you are a teacher training student. If you would like to get more information about Disabled Student Allowances, call the Student Finance customer service telephone number. Call the Student Finance customer service telephone number 0300 100 0601 in order to get in touch with a member of the Student Loans Company. This is the contact phone number that you can call if you are not satisfied with the processing of your loan or any service that you have received and would like to make a complaint. Alternatively, you can submit your complaint by sending them an email at [email protected]. For any questions or concerns that you have with FCA, go to their website at https://www.fca.org.uk/ to find the FCA customer service telephone numbers. Scroll down to the bottom of the web page until you find the Contact Us link. Click on it and it will take you to the web page where you can get the FCA contact number helpline that you are looking for. Call the FCA customer service telephone number 0800 111 6768 free number or 0300 500 8082 for any questions or concerns that you have with regard to the services that they provide. If you are calling from outside the United Kingdom, dial +44 2070 661 000. Aside from calling the FCA contact number helpline, there are other ways that you can do in order to submit your enquiries to them. You can make an enquiry by sending them an email at [email protected] or by filling in their email contact form which can be found on their website. You can also get in touch with one of the representatives from the FCA customer service team using the consumer live chat option that is visible on their website as well. If you suspect that you have been contacted by an unauthorised firm or an individual carrying out an FCA regulated activity – that often cold call people – report it to the FCA using their fraud report form. Most of the firms offering financial services in the United Kingdom must be authorised by them. You should only do business with authorised firms. You can always check on the Financial Services Register to make sure that the firm that you are dealing with is authorised. When making a fraud report, make sure to provide them with as much information as you can about the particular firm or individual who contacted you. Fill in separate report forms if you have been contacted by multiple firms or individuals. Tell them about the firm that you are reporting to them and the reason why you are reporting them. If you have lost money to fraud, then it should be reported to Action Fraud on 0300 123 2040 or online at http://www.actionfraud.police.uk/. For firms including consumer credit firms and people representing a firm that have any enquiries to make, contact the FCA customer service telephone number 0300 500 0597. This is also the phone number to call for systems or application related queries. If you are calling from outside the UK, the contact number to dial is +44 2070 661 000. Apart from giving them a call on the FCA contact phone number, your enquiries can also be submitted to them by completing their firm email contact form. Alternatively, you can send them an email at [email protected]. You also have the option to download a printable form and send it to the address above. Once you have submitted your complaint to the FCA, they will acknowledge it within 5 working days, and they will inform you within 4 weeks if your complaint is inside or outside the scope of the Scheme. Following that, they will contact you on a regular basis to keep you up to date with their investigation. They may decide to deal with your complaint locally. This enables the area of the FCA most closely connected with the issue you are complaining about to respond efficiently. In case you are not satisfied with the way that your complaint is handled locally, you have the right to contact the Complaints Team for a Stage 1 investigation. Call the FCA contact number helpline and they will investigate your complaint independently and impartially, in line with the Scheme. They will investigate your valid complaint thoroughly, passing lessons learned to senior management and the rest of the business to make sure that the FCA constantly improves its performance. If they consider your complaint to be justified, they will let you know what they are going to do in order to resolve it. The resolutions that they might offer include an apology, taking steps to resolve an error, and a compensatory payment on an ex gratia basis, where appropriate. Should the FCA conclude that your complaint is not justified, they will provide you with their reasons. If you are still not satisfied with the progress of your complaint or the way that the FCA has dealt with it, you have the option to refer the complaint to the Office of the Complaints Commissioner. This should typically be made within 3 months of their final decision at Stage 1 investigation. If you refer your complaint after the 3 month time limit, the Complaints Commissioner may still be able to consider it if there are valid reasons for the delay. You can refer the issue to the Complaints Commissioner directly if the FCA excludes or cannot investigate your complaint under the Scheme. They have discretion to decide whether or not the complaint falls within the scope of the Scheme. If so, they can either propose to carry out an investigation or require the FCA to carry out its own investigation first. You can use the similar methods aforementioned for any complaint that you would like to make about the Prudential Regulation Authority or the Bank of England. For any media enquiries, call the FCA contact phone number 0207 066 3232 to get in touch with their Press Office Team. For journalists who need to access their out of hours service, dial 0779 535 1956. Alternatively, you can send them an email at [email protected]. To communicate with their Head of News, Chris Hamilton, send an email to [email protected]. To get a hold of one of their Press Officers, email Ruth Wharram at [email protected], Diana Yeboah at [email protected], Nick Offord at [email protected], and Mark Dixon at [email protected]. You are not required to provide them with your identity or contact information, while it would make it easier in case the FCA needs to clarify things or ask for additional information. If you have given your contact information, then they may well proactively get in touch with you if they need any other information, unless you specifically ask them not to. The FCA would like to know more about their whistleblowers. If you feel comfortable about telling them, they would like to know your age, your position and length of time at the firm, and whether you made the disclosure internally and if it caused you any harm as a result of this. They would only use this information to improve their knowledge and they would not share it with other organisations.